For many of us the camping season is over and it is time to winterize your RV water system, if you have not already done so. This is a big step in the process to getting your home on wheels perfectly set for winter storage. Properly winterizing and making sure that the fresh water tank is completely empty before closing up is very important if you don't want to walk into a disaster, when you finally take it out of storage in the spring. If by some chance you have a pipe or valve burst, or freeze damage to the water pump, we have all the replacement parts you need to get you back up and working again. Here is suggested step by step winterizing instructions to follow for protecting your RV water pump from freezing during the winter. Before we go into the steps here a few things you may need to do this job properly. On an average of 2 to 3 gallons of RV antifreeze is needed, depending on the type of system you have. Some newer RVs' come with a by-pass kit for the water heater already installed, but if not you will need one. You will need a water pump converter kit and basic tools for installation. Last you if you don't have a self cleaning system built in for your black water tank, you will need a wand to clean it out. Make sure you have these RV supplies, then follow these steps. 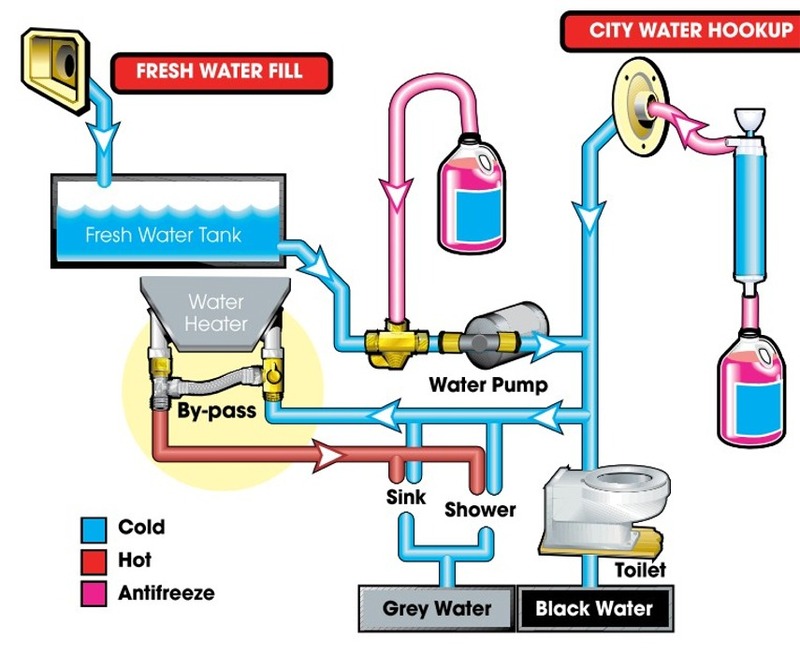 Drain the fresh water tank, then the grey and black tanks (clean out with wand if you don't have a built in cleaning system). Drain water heater by removing the drain plug and opening pressure relief valve. Important Note: Do not drain while under pressure or hot. Open all hot and cold faucets, and low point drain lines. Using the water pump can help drain out all the water, turn back off when done draining. Once all water is drained, flushed the toilet a couple times to make sure there is no more water, then close all the faucet and drain lines. When getting ready to add the antifreeze the first thing you will want to do is set up the by-pass line for the water heater. 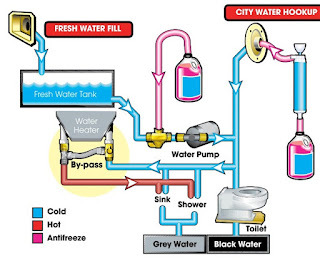 The water heater does not have to be stored with antifreeze, by using the by-pass it will stop the antifreeze from entering the water heater and save you money. Next you want to install the water pump converter kit, connect the tubing to the water pump inlet then into the jug of antifreeze and turn pump on to pressurize the system. Open faucets slowly starting with the closest to the water pump and working your way to the furthest, open hot first, then cold, keeping valve open til you see the antifreeze color. Repeat this with all faucets and remember to include exterior water. Last flush the toilet as many times as it takes to have the antifreeze color in the toilet. Turn off pump and open a faucet to release pressure, then to help protect the holding tank, pour 1 cup of antifreeze down each drain and flush some down the toilet. Last turn off the electric heating element on your water heater, if the unit has one and make sure all faucets and valves are closed. Now your RV water pump and system is winterized. Check your RV owners manual for any other instructions or if you have an ice maker or washing machine. Shop RVupgrades.com today for all your RV water pump winterizing supplies. If by some chance your water pump froze during storage, check out our wide selection of RV water pumps, we have many that are a perfect replacement for your system.